The 2017 Jaguar XE 35t AWD. Day one of Media Days is a driving program, with journalists taking cars from the staging area at Quail Lodge in Carmel Valley to Mazda Raceway Laguna Seca via Laureles Grade. Once there, you swap cars with another journalist for the drive back, and then swap cars again once back at the Quail. Apart from an hour's lunch, this is your day from 9:00 a.m. to 4:00 p.m. 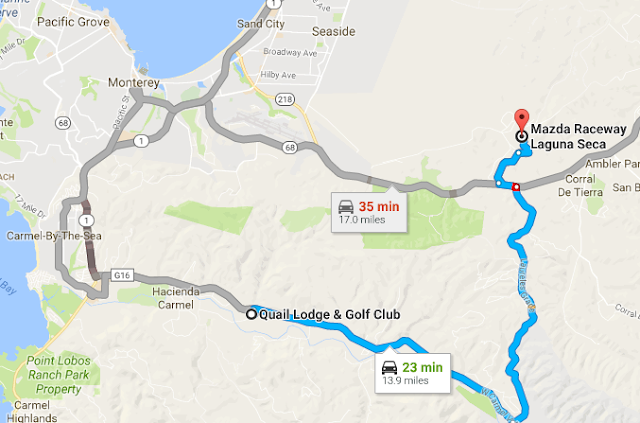 I jumped in the 2017 Jaguar XE 35t AWD for my first run of the morning (the longest one of the day, from the Monterey Tides Hotel at Sand City, past Mazda Raceway, onto Laureles Grade and then back west via Carmel Valley Road to the Quail. 2017 Jaguar XE 35t AWD. Thirty minutes was double the amount of time I'd had in an XE previously, in San Francisco afternoon traffic. And it is an entirely different breed of cat on a twisting, turning road. The days of Jags being rolling gentleman's clubs (in the 1917 London meaning of the term, not the 2017 Las Vegas meaning) are long gone. This is a serious driver's car...eating the curves with plenty of power for those brief straightaways. And the brilliant handling doesn't come with a degradation in ride quality. It's firm, yet supple. The XE can be had for as little as $37,225 with a 180-horsepower 2.0-liter turbocharged diesel, but the one I drove was the top of the line. 35t AWD in Jaguar-speak means 380 horsepower, a 3.0-liter supercharged V6 and all-wheel drive. Jaguar claims 0-60 in 5.1 seconds and a top speed of 120 miles per hour---and both seem conservative estimates. 2017 Jaguar XE 35t AWD interior. At a base price of $54,775, the XE 35t AWD finds a near-perfect balance of performance and luxury...feeling more like a contender against the BMW 5-series than the 3-series it actually competes against. We weren't provided window stickers or fact sheets, but noodling around with Jaguar's "build it" section of their website, I see the Caesium Blue paint is a $565 option, the Black Pack, with gloss black side power vents and a black surround for the grille is $360, and I'm pretty sure the one I drove had the Technology Package ($3,265). That would get us to $59,600 including $995 delivery and destination charge. I drove two other Jaguars that same day (out of ten vehicles total), both of which are lustworthy (reviews coming in the next few days), but the XE 35t AWD is the one I'd buy if I could only have one.